This is my first post to this site, even though I've visited in the past. Thanks for all you do for the gaming community and the valuable information you all provide! I'm here because I recently found an interesting trio of items, and I'm hoping to learn more if anyone knows more. 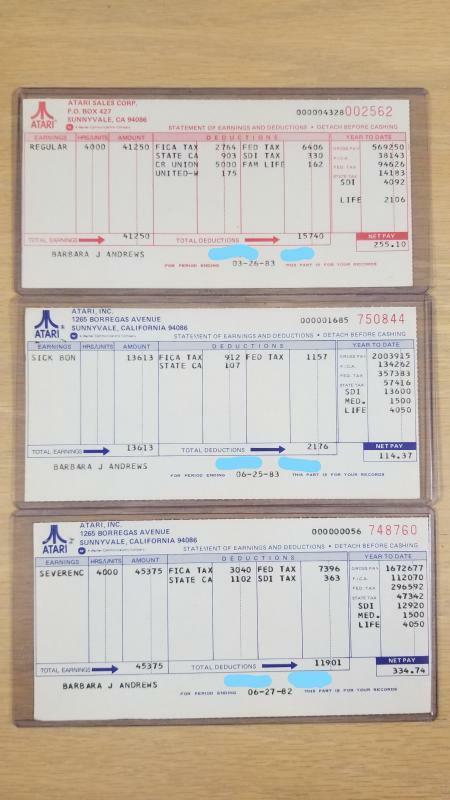 These are Atari employee pay stubs from '82-'83, which include a regular pay stub, severance package stub and a "sick bonus" stub which I'm assuming was a PTO payout of some kind. These are interesting enough on their own, but what makes them even more unusual is the fact that they came from right around the time of the crash. Even more unusual is that the "severance" stub was from '82 and the others from '83, possibly meaning that this employee was terminated in '82 and brought back to work in '83 only to be met again with termination most likely due to the crash. That's about as much as I know about these, hence my reason for starting this post. I can't find any information on the employee (name is in the photo). I don't know anything on the timeline of this person's employment besides the tale the stubs tell. Did/Do any of you possibly know her, or recognize these? Any information you all may know would be appreciated. I'd love to know more about this person's story if it's out there. Also if this is in the wrong category, let me know. There wasn't really a "help" forum for these kinds of things lol. These are really cool. At home I have the atari phone directory on my desktop. When I go home I can search through it . Should be able to tell me what department that person was in. Thanks for your reply Scooter! Yeah these were a first of their kind for me. If you are able to find this person, I would be very grateful. I'm glad that a directory exists somewhere, and I appreciate you offering your help on this. Look forward to any info! This is really neat stuff! Funny enough, these stubs are easily worth more than three shares of stock for the company who issued them. Atari Liberator (C) 1982 Atari - can someone upload it?